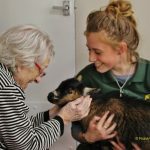 Animal Magic at Care Home! Animal-magic! This is how I would sum up my experience doing this memorable photo shoot! Today the staff and residents of a residential home in Clacton-on-Sea were expecting some very special visitors. The Wellieson team from Colchester were bringing some of their four-legged animals from their farm. As I stood waiting patiently in the lounge area, in trotted two pygmy goats and wandered around inquisitively to a chorus of ooohs and ahhs from the residents. 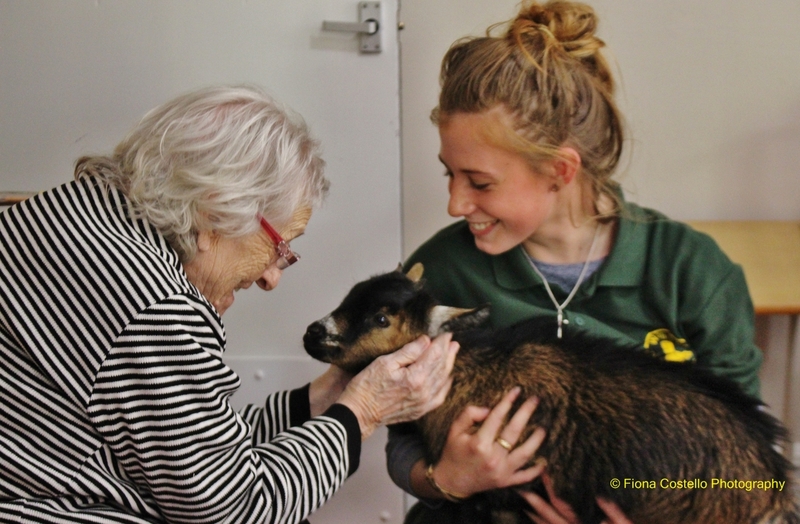 The Wellieson team were quick to pick up the goats and offer them to the residents to pet and cuddle. There was an opportunity here for two of the residents to bottle feed the goats. The positive effects were evident to see, from the most able-bodied to the frailest or most withdrawn resident. 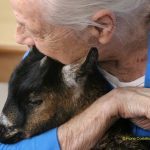 One dementia resident had a pygmy goat sat on her lap. She was gently singing to the goat and stroking it for at least 15 minutes. The goat looked completely mesmerised and relaxed. It’s not often I see a baby goat sit still for more than a few seconds! It is evident that animal interaction helps people to relax, reduces stress and emphasises the importance and benefits of being tactile with a pet can bring. Research shows that stroking and playing with, feeding and looking after animals is good for the health and can reduce stress and blood pressure levels. Helping residents to reminisce and recall happy memories from the past is a good reason to have pets/animals in the care home environment. 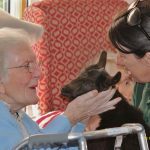 It was clear to see how much joy the animals brought to the residents and how much they are needed and valued in the care home industry. I felt privileged to be part of this scene and to capture such magical moments through the lens. Do visit Wellieson website to learn more about their ‘flat-pack-farm-visits’.